by a group of friends in Plaisance du Touch to help Dominique’s parents : Jacqueline and Jean Pierre Delpech. As all parents confronted with their child disability, Jacqueline and Jean-Pierre DELPECH searched for solutions to help Dominique. They finally decided to take him to England to be trained in multi-sensory stimulation techniques to perform at home. This technique, they hoped, would provide Dominique with a better lifestyle. Sadly, Dominique died shortly before his planned trip to England. 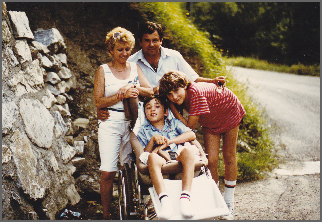 In 1985, Jacqueline and Jean-Pierre DELPECH, decided to keep the Association running to help other families of handicapped children, with the aim of developing access to multi-sensory stimulation in France. For 20 years, the Association Dominique was located in Plaisance du Touch. In 2004, laying of the first brick of the Dominique House in Fonsorbes on land donated by the mayor. Today, training sessions with independent practitioners are organised daily. Our efficacy relies on the trusting and friendly relationships we have established with our families. Our only aim is to help families and their children. on average 150 children each year (bi-annual evaluations). Jacqueline Delpech, has written a book telling the story of Dominique’s life and the creation of the Association Dominique. This book is on sale at the Association Dominique and the benefits are entirely donated to the Association. The Association Dominique would never have been able to help over 1500 children if devoted and competent helpers had not been present. If we consider that on average, for one child 20 volunteers are present to help with the exercises prescribed by the practitioners, we can imagine that more than 30 000 volunteers have heard of the Association Dominique. Each child has reaped the benefits of this type of therapy and the love and devotion of volunteers. I believe that our association will continue to exist so that parents can find solutions for their child. Parents are the best therapists. "In 1984, a friend of mine asked me to help the Delpech family who were looking for volunteers to do « stimulation » sessions with their son Dominique who was suffering from a rare disease. Unfortunately, Dominique passed away. But Jacqueline and Jean-Pierre decided to continue with the Association Dominique. At the beginning, I was still working and couldn’t find time to help out, but in 1990 I joined the Association’s cooking team of volunteers. The Dominique House was created in 2005 and and I carried on helping out until 2012. I « retired » for the second time on my 80th birthday ! This experience taught me a lot from a human point of view. Meeting people suffering from disabilities has made me see life from a different angle. I thoroughly enjoyed giving my time to the children and their families. The ambiance was warm and friendly with the other volunteers, not to forget Jacquie, always in a good mood, Sandra the secretary and members of the committee. the go-between for families of handicapped children and teams of practitioners. making life easier for parents and their handicapped child. by creating a musical environment for handicapped children living in the Toulouse area in partnership with other institutions thanks to the sensory organ financed by the « Club Rotary Toulouse Jacobins ».